"Records are accumulating in the ‘Local History Recording Scheme’ – 652 approved records have been sent in, from 149 parishes. Correspondents were asked to collect without delay all possible information as to the effects of war on the different parishes in the county. Notes were required on such matters as the ploughing-up of grasslands, war service, the effects of enemy action, evacuation, billeting and the work of the various wartime organisations." Was there a War History record for Arborfield? Yes - it was completed as late as 1953. 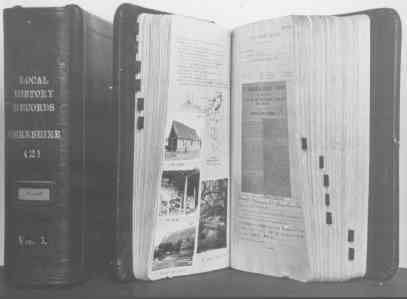 There are two copies of the Local History Recording Scheme available: the first is at the British Library, and the second is at the Local Studies Library, as shown here (photo: Reading Local Studies Library). Both are loose-leaf binders in alphabetical order by parish. Arborfield is reference 'A-6' in Volume 1. The Local Studies Library has a leaflet explaining the scheme, entitled "The Local History Recording Scheme. Notes on recording local history : by C.B. Willcocks, F.S.A. ", published by the Berkshire Local History Committee in 1952. PARISH OF: Arborfield REFERENCE NUMBER: A.6. Also: PARISH OF: Barkham REFERENCE NUMBER: B.1.